Research for this working paper was undertaken by the author between September-November 2014 when she was awarded the 2014 Human Development Fellowship by the International Centre for Human Development. The Centre is a partnership between the Indian Institute of Advanced Study Shimla, Government of India, and the United Nations Development Programme. 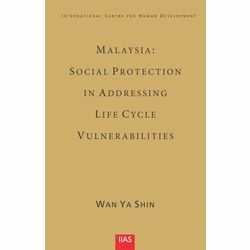 This study examines the social protection system in Malaysia using the life cycle approach. The overarching question is: Are Malaysians socially protected throughout their lifetime? Analysis is done through the gender lens as the needs of men and women are different even at the same point of time in life. At each stage of life, the main vulnerabilities faced are identified and the availability of social protection as well as gaps in the system are discussed. Further analysis is done to focus on Bumiputera minorities which is recognised as a vulnerable group in the country. Malaysia has many social protection programmes to protect the people from vulnerabilities and risks at different stages of life and to promote a decent living standard. However, social protection has yet to be seen as a comprehensive system and gender mainstreaming has yet to be successful. More focused efforts for the vulnerable group is needed to ensure that programmes and schemes for them are effective and efficient. The final goal is to help the people ‘graduate’ out of social protection and be resilient to vulnerabilities and risks. Research for this working paper was undertaken by the author between September-November 2014 when she was awarded the 2014 Human Development Fellowship by the International Centre for Human Development. The Centre is a partnership between the Indian Institute of Advanced Study Shimla, Government of India, and the United Nations Development Programme. This study examines the social protection system in Malaysia using the life cycle approach. The overarching question is: Are Malaysians socially protected throughout their lifetime? Analysis is done through the gender lens as the needs of men and women are different even at the same point of time in life. At each stage of life, the main vulnerabilities faced are identified and the availability of social protection as well as gaps in the system are discussed. Further analysis is done to focus on Bumiputera minorities which is recognised as a vulnerable group in the country. Malaysia has many social protection programmes to protect the people from vulnerabilities and risks at different stages of life and to promote a decent living standard. However, social protection has yet to be seen as a comprehensive system and gender mainstreaming has yet to be successful. More focused efforts for the vulnerable group is needed to ensure that programmes and schemes for them are effective and efficient. The final goal is to help the people ‘graduate’ out of social protection and be resilient to vulnerabilities and risks.